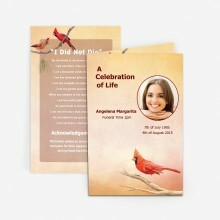 Want to design your own funeral programs but hope to keep printing costs and paper costs to a minimum? 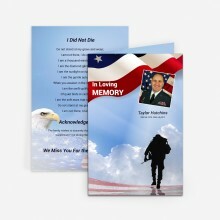 Funeral cards are the perfect choice. 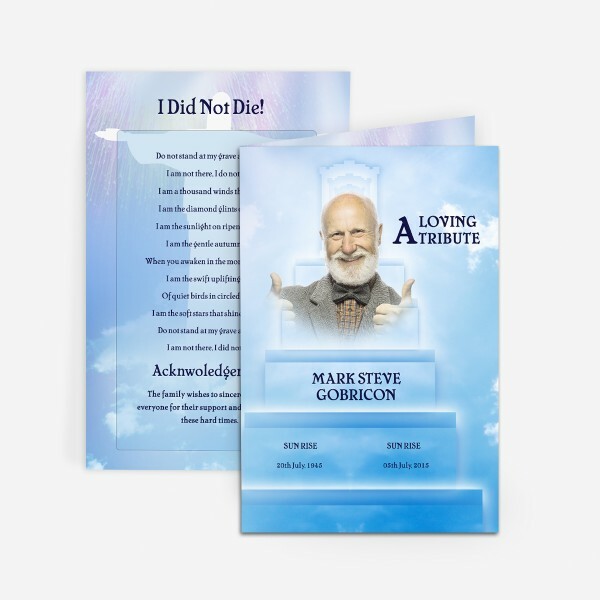 While our funeral card templates allow you to create touching keepsakes to distribute at the memorial service or funeral, the funeral cards print four to a page, meaning less ink and paper is required to produce them. 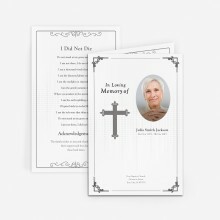 Like our Funeral Program Templates, the Funeral Card Template is editable with Microsoft Word and easy to customize. The ‘Stairway to Heaven’ Funeral Card is one of our most popular funeral cards. 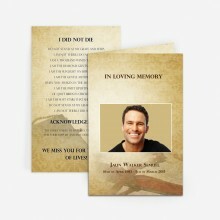 The funeral card template symbolizes the stairway to heaven that your loved one traveled throughout his or her life. Rendered in soothing tones of blue and lavender, the funeral card shows a staircase on its cover. The bottom stair is free of ornamentation. The second stair shares the birth date and death date of the person of honor, and his or her name appears on the third stair. At the top of this staircase, you can see the pearly gates of Heaven in the background, and your loved one’s image will be superimposed over top of it to signify their newfound place in Heaven.